Super Hero Boy: I keep hearing squeaking and giggling coming from Connor's bed? I keep hearing squeaking and giggling coming from Connor's bed? Connor has a new playmate and as far as he is concerned he is as alive as his best buddy Melos (the Chihuahua for those of you that have not been paying attention.. heh). Though I wouldn't have at first actually thought of the Wowwee Alive Cubs as a toddler's toy its been one of the biggest hits of the year with Connor. He has a Wowwee Alive Cub Panda and his poor panda spends most of his day being drug from one end of the house to the other. I pretty routinely find them sitting together in Connor's big purple chair, Connor petting his panda or "reading" him a book with Melos looking on close by feeling a little left out. 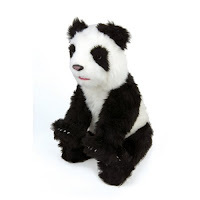 The Wowwee Alive Cub Panda is pretty unique as he really does not have a off or on switch (you can turn him off through the battery pack if necessary though) he just responds to movement and touch. Pick your Wowwee Alive Cub and he will open his eyes, blink, make noises and open his mouth appropriately. He has two touch sensors one in the top of his head and one on his back which are actually very sensitive. Connor's tiny hands and light touch easily activates them when he pets his panda or touches his back. The most impressive part though is the fact that the Wowwee alive cub seems to know if you are moving him about and will respond either with noises or if you lay him on his back he will start to snore and then eventually turn himself off if you do not move him again for awhile. This makes it possible for the cub to sleep in the bed with your child though I do warn you that you may end up waking up to giggling in the middle of the night like I did the night Connor decided that he just had to play with his cub at about 3 am. heh. Poor Melos he thinks this new "furry beast" has taken his spot but I'm positive that Connor has not forgotten about him. I should note that the Wowwee Alive Cub is not super loud nor do I find him at all annoying he actually makes far less noise than any of my dogs and certainly much much less than any of Connor's other battery powered toys. I was concerned with the fact that the batteries would wear out fast seeing as Connor plays with him so often but thus far we have not had to change them and I don't forsee us having to change them soon which is a huge plus. There is nothing to learn on how to play with them so they are fun for a toddler to play with but an older child would love them just as much. They are currently available in a panda, white tiger, lion and polar bear! You can watch videos about the Wowwee Alive Cubs on their website. They are available at most major retailers and toy stores but you can also purchase one directly from the Wowwee store! I have some awesome news.. I have a Wowwee Alive White Tiger Cub to give away to one lucky reader! Leave a comment on this post. Check out the Wowwee Alive Cubs and tell me which cub is your favorite! They're all adorable, but the White Tiger Cub is actually my favorite. Your story about your little one makes a great advertisement for this toy. The Panda Bear Cub is my favorite! The panda bear cub is my favorite. My niece is in the Panda room at school and would love to have one of these. Thanks! I like both of the bears, but I think the panda is my favorite. For some reason it just looks more cuddly than the other three. Oh, and I'm a subscriber. They are all so cute! I think the polar bear cub is my favorite. The "LION CUB" big Disney "Lion King" fans in my house! They are all adorable though! My favorite is the lion cub! I think they're all adorable! Can't decide which I like best..maybe the White Tiger Cub or Panda ? I like the White Polar Bear and the Tiger equally. How can one choose? They are all so cute. But I think the white tiger cub is my favorite---white tigers are my favorite at the zoo, too. They are all so cute! I'm partial to the White Tiger Cub. The white tiger is actually my favorite but I also really like the lion cub-so cute, but doubt I would let my son nap with it. It looks like way too much fun : ) Thanks!! The white tiger is my favorite. Tigers are my second favorite animals, next to regular house cats. LoL. Love the Lion Cub -- just adorable. fingers crossed for my little boy! I would be tickled pink to have any of these adorable furry pets. It was a really hard choice and I keep switching back and forth from the Lion cub to the White Tiger cub but think I will go with the White Tiger because those blue eyes are awesome! Thank you for the giveaway and Happy Holidays to you! The white tiger is my favorite, but the polar bear is stinkin' adorable too. These are simply amazing!!! I love the lion cub. Would love to win one for my son who is so into animals! I think they are all adorable! I'd have to say my fav would be the white tiger cub though. The White Tiger Cub is so cute! I would love that one. Thank you so much! I like the lion cub the most. How cute! I so love the Panda cub. I would just love to win this for my little girl. My little boy would absolutely love this! I like the White Tiger. I love the white tiger cub the best. I think my daughter would love the Panda the most! my daughter would love the polar bear! I love the White Tiger. My little boy picked the Lion Cub as his favorite. Crossing our fingers! I love the White Tiger Cub! His blue eyes are sooooo beautiful! These are so adorable. My son would love the White Tiger Cub the best. His face and eyes are so precious. Thanks for this giveaway. I know my grandson would love the lion cub. I showed them all to my daughter and she really liked the panda cub best. I liked the white tiger cub best. Thanks for the chance. I love the White Tiger Cub. He has beautiful blue eyes just like my grandson who I would give him to. The White Tiger Cub is stunning. Please enter me in your drawing for this wonderful prize giveaway drawing. I appreciate it very much! I love the Lion Cub. My kids would go crazy over this. The polar bear is cute. I love the white tiger! We'd love the panda cub! These are great!!! The White Tiger Cub is my favorite! I subscribe to your list! I think the Panda is adorable, I'd love to give that to my niece for Christmas! I love them ALL!! I love how the tigers eyes are so blue and I love how the panda just looks like he needs me (I mean my kiddos) to cuddle him! Thanks for another great product review and giveaway! My son loves the Panda.....and I do too! I love the white tiger! He is adorable. I like the polar bear cub! My daughters coo over the white tiger cub every time we see it in the store. The Polar Bear Cub is my choice--but any of them would make a good 'pet' as well as giving a chance to teach a little about wild animals. They all look so cute! I would have to say the Panda is my favorite. I can't choose between the white tiger and the polar bear. They are both so darned adorable! I love the White Tiger! Wonderful giveaway! I love the White Tiger Cub. Thanks for the contest! Holt loves the White Tiger, but I think all of them are beautiful. White tiger Cub is the cutest. I like the Lion Cub--he looks like my cat, Joey! I like the white polar bear as a surprise for my daughter. I love them all, but I think my favorite is the white tiger. thanks for the contest! I LOVE the white tiger cub. It looks just like our lynx ragdoll. Just beautiful. I would LOVE to win this. I like the lion cub, what a cute face! I really like the Lion Cub. It looks just like Eliot, our goofy, inquisitive house cat. they are all sooo cute! the white tiger cub is my favorite. I like the lion cub. The panda bear cub is my favorite. Thanks! I like the white tiger cub. They are all cute! I would have to say the lion. I'd have to say the White Tiger cub - I love tigers! I love the lion cubso adorable mygrandaughter wants that so bad for christmas will see. My son wants the White Tiger Cub. Santa is a little short this year so we will hope for the best! The White Tiger Cub is perfect for my grandson! Those are all amazing. Tough decision, actually, but I think I like the Lion Cub the best. This will make a wonderful surprise for my little nephew. Thank you for the great give-away. My favorite is the lion cub- it looks so real! 1- OMGosh the polar bear is so cute. Polar Bear Cub for sure! I love them all, really. They are so cute. My son wants the panda. My little girl really wants one of these, but we've already spent all of her Christmas money. The white tiger cub is my son's favorite. I have a new post about this giveaway on my blog. The polar bear is the cutest thing!! DS collects white tiger stuff, so guess which I would choose? My daughter would love the panda cub. omg how adorable!! I would totally love to get my daughter White Tiger Cub. Such a great contest, thank you for the chance! The polar bear cub is cute. They are all so adorable--it was a tough decision but my favorite is the Lion Cub! Thank you for the contest! The White Tiger Cub is my favorite for my grandson. The lion cub is my favorite. They are all cute, but I am partial to the Panda. Thanks!! I like all of them! I think my favorite would either be the polar bear cub or the panda cub. The White Tiger Cub is so cute. White Tiger or Panda are my favorite! This is on my Daughter Jalyn's Christmas List! I would love to win this for her. Please enter me in your contest. Thank you. The White Tiger is my favorite. My little one would love the white tiger cub! Thanks for the giveaway! they're all cute but the white tiger cub is my fav! We like the lion cub. The lion at our local zoo had cubs this year and the Wowee cub looks just like them. They are all very cute but I would pick the lion. Thanks for the giveaway! the white tiger cub is adorable. thanks! My daughters have ooh-ed and aah-ed over the white tiger every time they see it in the store. I like the White Tiger cub the best. I like the white tiger cub best but they are all cute. I love the white tiger cub, but they are all cute! Our family love the polar bear, looks like our dog. I like the White Tiger !!! The White Tiger Cub is my favorite but they are all adorable. I love the Lion Cub and his purr! I hope that if I win then my niece will let me play with it too. The lion cub is so cute and realistic looking! I'm a subscriber as well, thanks! The Lion Cub is adorable. Thanks for the giveaway.